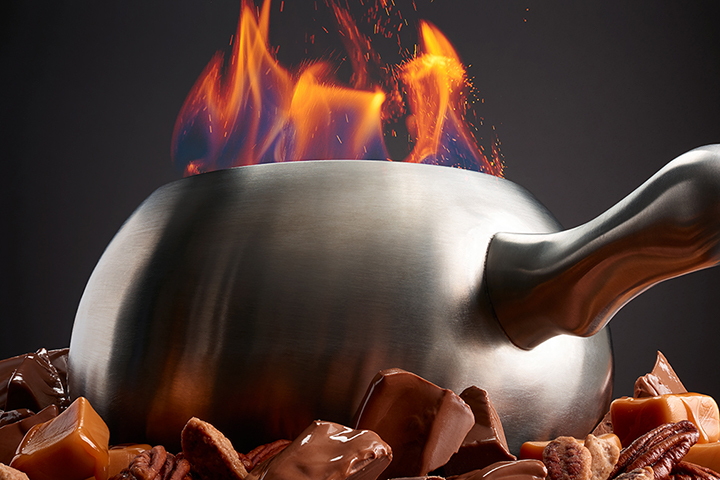 Specialized chocolate fondue only available to you. Ask your server for more details. GIVE TE GIFT OF FONDUE! Link to GIVE TE GIFT OF FONDUE! A "put the phone down" and make new memories experience is what your family needs for Easter. Time together. We are featuring a delicious three-course fondue menu with an add on option for chocolate fondue! An add on for chocolate fondue is available for $9.50 per person! Make your reservation now! Visit us on April 15 for "Tax Day." Where we know, Happy hour priced cheese fondue, chocolate fondue and specialty cocktails is needed ALL night long. Our in-house Sommelier has prepared a specialty wine flight that will be presented with a uniquely made four-course fondue menu. Available all month long! $60 per person including the four wines. March 6th marks the day where we start serving our ever popular Endless Seafood four-course menu! Available daily until April 21st. Don't sacrifice flavor with our endless seafood four-course fondue menu! This $44.99 per person menu includes any cheese fondue from our regular menu, any salad from our menu, an entrée that consists of Atlantic Salmon, Wild-caught Mahi Mahi, Pacific White Shrimp, Sesame-crusted Ahi Tuna and Sundried Tomato Ravioli and for dessert, any one of our chocolate fondues off our menu. Don't miss this delicious menu! For National Beer Day, stop in and enjoy one of our Fox River Brewing delicious craft beers for $1 off, either draft or bottle with any meal! Join us on National Cheese Fondue Day for a special offer for any of our cheese fondues! For only $4.11 per person you can experience any of our cheese fondues with the purchase of any combo meal! Book a table today. Show you administrative staff how much they are appreciated by giving them a night of delicious food and a relaxing experience with a Melting Pot gift card. Happy hour pricing all day long at the bar in celebration of National Pretzel Day! One of our favorite dippers in our cheese fondue. A match made in heaven. Join us for our reinvented, reinvigorated, absolutely FUN-DUE Ladies' Night Out! Enjoy our three course cheese, entrée and chocolate offer for only $30! Reservations are recommended. No other coupons or offers available with ladies night please see store for details. Not valid on holidays! Visit us on our Facebook page to view our monthly themed ladies nights! Work up an appetite for Endless Fondue (entree course only) at The Melting Pot of Appleton. We're talking all the entree favorites you can handle. So start getting hungry. The evening's four-course dinner includes your choice of cheese fondue; choice of salad; an endless fondue entree including filet mignon; succulent white shrimp; teriyaki-marinated sirloin; all-natural breast of chicken and featured pasta, plus an array of fresh vegetables and your choice of one of our decadent chocolate fondues. *Offer is valid at this location only for a Limited Time Only. Endless applies to the entree course only. Not valid with any other promotional offer, discount or dip certificate. Substitutions may be available. See store for details or restrictions. * Tax and gratuity not included. Sometimes you just need a delicious happy hour or two after long stressful days. That's where we come in. Monday - Friday • 4 p.m. - 6 p.m. • 9 p.m. - close. $4 craft beers, $5 wines and cocktails, $6 cheese or chocolate fondue. (Bar and bar tables only) Excludes Holidays. Every Sunday after 4pm kids 12 and under will receive a free kids entree (8.95 Value) with the purchase of an adults 4 course meal or the purchase of a fondue by you entree! We offer teens and their friends an ideal dining experience for their perfect night out at The Melting Pot. They’ll "wow" their date and/or group of friends with three fabulous dipping courses, a soda, and an experience each will remember for a lifetime. Click for more information! We offer teens and their friends an ideal dining experience for their perfect night out at The Melting Pot. They’ll "wow" their date and/or group of friends with three fabulous dipping courses, a soda, and an experience each will remember for a lifetime. Begin with a favorite cheese fondue with apples, vegetable boat and fresh breads to dip. Enjoy the Royal Entrée which includes teriyaki-marinated sirloin, white shrimp and breast of chicken which is paired with a bowl of bottomless veggies. Finally, let your taste buds melt with one of our delightful chocolate fondues served with fresh strawberries, bananas, pineapples, Rice Krispies Treats, tasty marshmallows, pound cake, blondies and brownies for you to dip. Vegetarian entrée options are available. Parents, rest assured that The Melting Pot would not serve alcohol to any teen table. Please call 920-739-3533 and speak to our general manager to make your arrangements today. Reservations are required. See store for details, restrictions may apply. We are proud of offer both gluten-free and vegetarian options. Please let us know upon making your reservation of any food allergies and sensitivities. Our staff is trained to handle questions about food allergens and will help you select your meal.